It just never seemed to be important. Walking the dog, walking around the block, shopping at the mall, heck most anywhere we went: Debbie just liked to hold hands and I didn’t. What a fool I was! Now, it is the ONLY thing we can share consistently. From the moment I walk in, no words are spoken and she rarely if ever says my name (unless to our daughter Jennifer!). Her eyes finally notice me and she reaches out her good right hand and holds my hand tightly for the next hour. Her fingers don’t stroke, her hand doesn’t twist or turn; just a firm, hard grip that NEVER lets go. So much is said between us in a relatively simple act. The need or desire to be close and know you are safe. The tactile sense of touch and being ever closer to her and the feeling of shared experience. A physical act that confirms we are still together in body, mind, and spirit. It is a priceless act that words cannot describe. We shared a moment this past December that I will never forget. She had been experiencing fits of tears and terrible emotion in her face that spoke of pain, fear, or whatever was ailing her, unable to share or speak what was hurting her. I tried for almost 30 minutes to change her mood; laughing, telling stories, feeding her, HOLDING HER HAND—but nothing worked. She cried all the more, searching my eyes for a cure that was not coming. My heart finally broke and I fell on my knees, gripping both her hands and burying my face in her lap, unable to watch her cry any longer. I sobbed audibly and all I could say was, “I’m sorry, so sorry!” Sorry I can’t help, sorry for anything I had ever done to cause you pain, sorry we are separated by a disease that cannot be healed. God and His angels must have heard my prayer. Within seconds she let go of my hands and cupped my face with her good hand, pulled it up ever so slightly, looked deeply into my eyes, and said “It’s going to be alright!” Immediately she stopped crying and sat there staring out beyond me without a care in the world. There was no oxygen in my lungs to breathe. Tears streaming down my face, I pressed my cheek to hers and kissed her softly. Human touch heals a broken heart and speaks a thousand words without an utterance. It’s a touch we have shared for over 42 years but never like this or more tender. Alzheimer’s is taking away Debbie’s mind as more and more words and physical acts are leaving her day by day. But it will NEVER take away her heart or her spirit, as God has given that to her for this life and the life to come. For more on the hope of Heaven, see Our Best Life Yet to Come: The New Earth, Our Eternal Home and Why Is Resurrection So Important?, as well as Randy’s book Heaven. 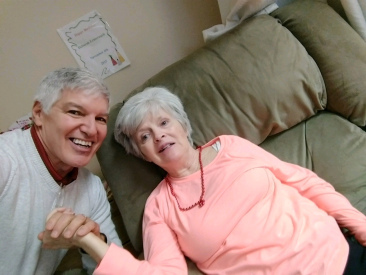 Since Debbie's diagnosis of early onset dementia, her husband Jay, a good friend and an EPM board member, has written eloquently about their experience. Each time he sends an update about Debbie, I’ve deeply appreciated his heartfelt insights, and faithful love for his precious wife. Thursday, June 2, Robertson McQuilkin went to be with Jesus at 88 years old. I wrote about Robertson in my book If God Is Good, sharing how at the peak of his career, he resigned as president of Columbia Bible College in 1990 to become the full-time caregiver for his wife, Muriel, who had Alzheimer’s.